When it turns golden brown add Salt and other spices along cardamom and 1 tsp of sugar. Now add peas and let them cook for 3-4 minutes. Add tomato sauce and mix it well. 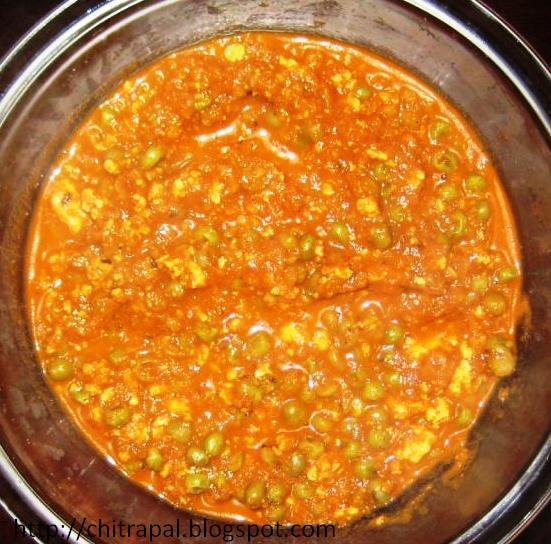 Cook for 5 minutes and then add curd to it and let the mixture simmer for 3 minutes. At last add paneer to your mixture and mix it well and let it cook for 10 minutes. Serve hot paneer korma with parantha’s or chapatti’s or make stuffed sandwiches for next day lunch. It looks very yummy i will definetly give it a shot this weekend. thank you chitra for giving us such a nice recipes. Pretty good and tasty. Thanks Chitra, I do enjoy your recipes. Hi chitra,i tried it a little,it came out so well . thanx a lot.